Today’s townland is Craigavad, on the County Down shore of Belfast Lough. You can reach Craigavad by walking along the North Down Coastal Path. 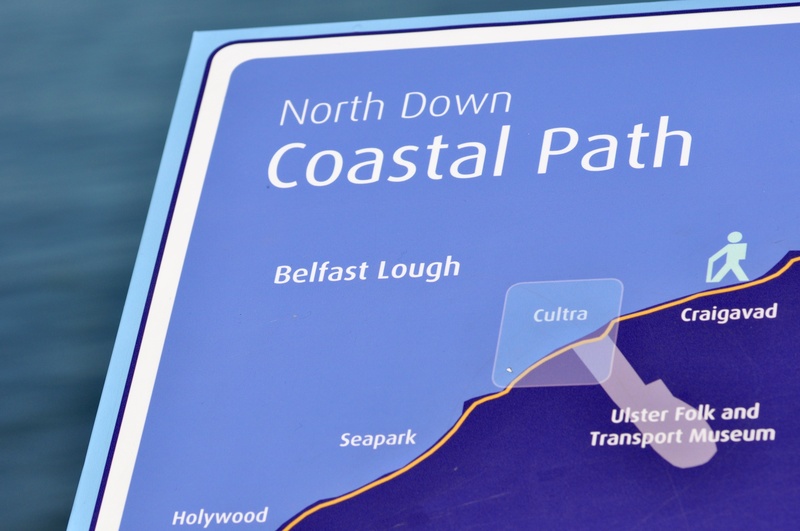 If you walk from Holywood, you pass through the townlands of Ballykeel, Ballymenagh and Ballycultra, before you cross the Glen Road and enter Craigavad. The next photo shows the Royal Belfast Golf Club, which covers a large part of this townland. The club was formed in 1881, and the members played golf in Kinnegar and Carnalea before opening this course in the grounds of Craigavad House in 1926. Craigavad doesn’t extend very far inland. By the time you reach the A2 road and the railway line between Belfast and Bangor, you are on the border with the next townland of Ballygrainey. Craigavad has a “Station Road”, but no station, as trains no longer stop in Craigavad. Station Road is now home to an activity centre for Girl Guides and Brownies, and the headquarters of Girlguiding Ulster at Lorne House. According to the PLACENAMESNI website, the name Craigavad probably comes from the Irish Creig an Bháda meaning “rock of the boat”. Another possible origin for the name is Mhada, meaning “dog” but actually referring to seals. I prefer the “boat” theory, because I don’t have any pictures of seals in Craigavad. 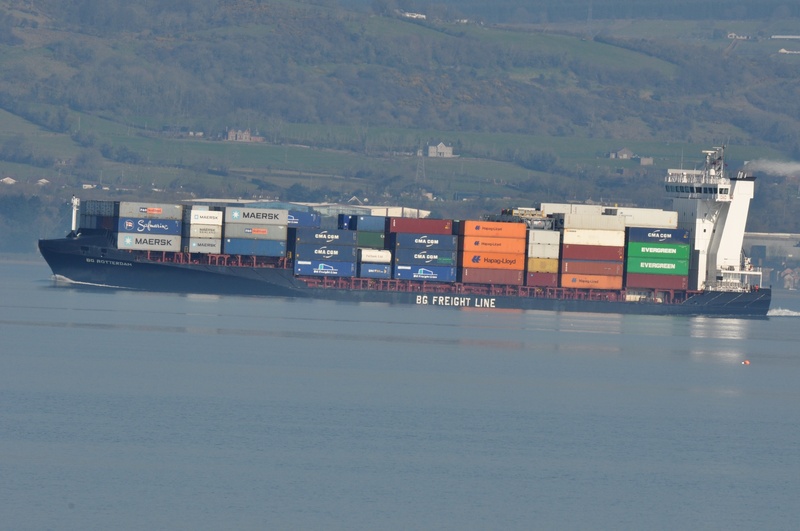 This container ship was passing Craigavad on its way to the port of Belfast. 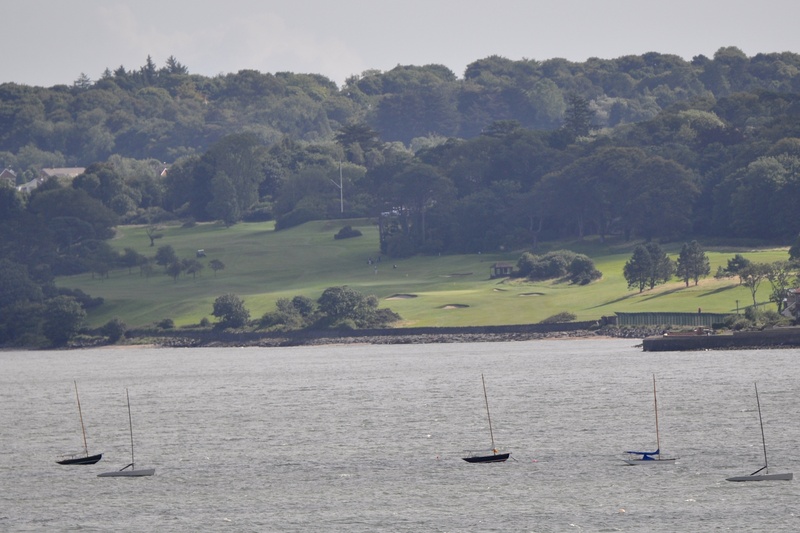 The land in the background is the County Antrim shore of Belfast Lough. 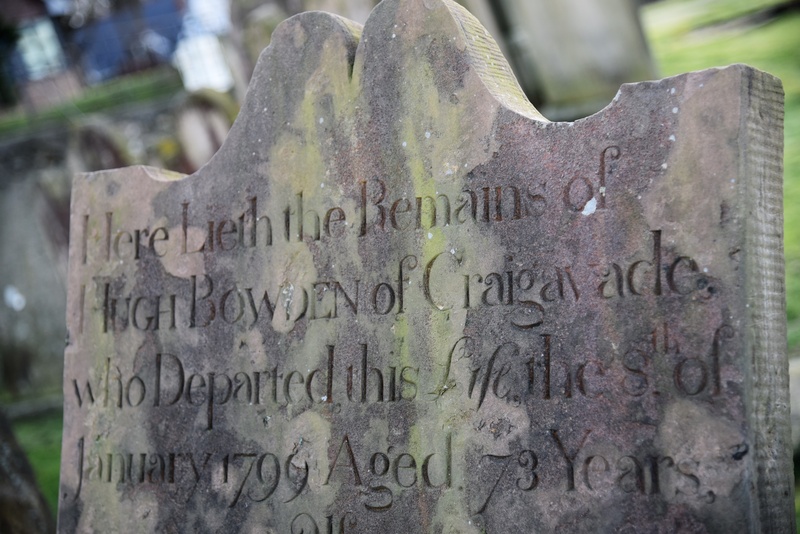 Finally, I have one photograph of an inscription from “Craigavade”, which I found in the graveyard at Holywood Priory. Click here for a map of Craigavad on Townlands.IE. What townlands border Craigavad? Along the lough shore towards Belfast, with the boundary following the Glen Road, Ballycultra. Towards Bangor, Ballyrobert. Moving inland, Ballygrainey. And finally, click here to read more about the history of the name Craigavad on PLACENAMESNI.org. Wow, I know someone named Hugh Bowden, so that caught my attention! Weird. I hope your Hugh is alive and well. If he’s descended from Irish Bowdens, let me know and I’ll send you the full-size photo of the gravestone.